肖建庄, 廖清香, 张青天, 强成兵, 柳献. 海水海砂再生混凝土与玻璃纤维增强塑料筋黏结性能[J]. 同济大学学报(自然科学版), 2018, 46(7): 884-890, 971. 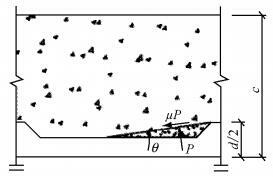 DOI: 10.11908/j.issn.0253-374x.2018.07.004. 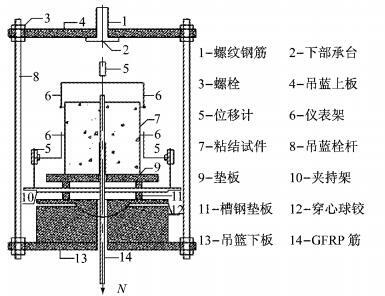 Abstract: The standard cube pull-out tests were conducted to study the bond behavior between the ribbed glass-fiber-reinforced polymer (GFRP) bars and concrete made with different raw materials and different strengths. 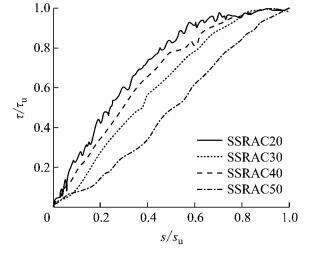 The results showed that the use of recycled coarse aggregate (RCA) decreased the bond strength while seawater sea-sand (SS) had nominal effect on that of concrete. 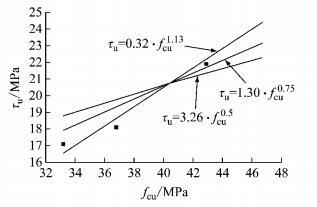 Different concretes shared similar bond stress-slip curve. 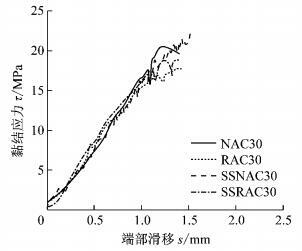 Similar with natural aggregate concrete (NAC), the bond strength between seawater sea-sand recycled aggregate concrete (SSRAC) and the ribbed GFRP bars improved with the increase of compressive strength of concrete. Furthermore, four bond stress-slip models were selected to fit the experimental curves and the results showed that all the four models fitted the experimental curves well and the model proposed by Malvar had the highest coefficient of determination. 试验材料如下：①海砂：福建海砂，基本性能见表 1.②海水：依据美国材料实验协会关于海水制备规程中所给的化学成分配而得，其中含量在0.1 g·L-1以下化学物质忽略不计，具体化学物含量见表 2.③天然粗骨料：4.75~31.5 mm天然石子；④再生粗骨料：4.75~31.5 mm再生粗骨料，为上海再生粗骨料厂提供，基本性能见表 3；⑤水泥：海螺牌，等级为42.5；⑥减水剂：聚羧酸高效减水剂；⑦GFRP筋：南京锋晖复合材料有限公司提供的带肋GFRP筋，肋高为3 mm，肋间距14 mm，基本性能见表 4. (1) 研究不同种类的混凝土与GFRP筋之间的黏结性能，水灰比固定为0.47(对应普通混凝土强度等级为C30).立方体试件：150 mm×150 mm×150 mm，每组制作6个，其中3个用于中心拔出试验，3个用于测量混凝土的立方体抗压强度，其配合比见表 5.表中，NAC表示天然混凝土，RAC表示再生混凝土，SSNAC表示海水海砂天然混凝土，SSRAC表示海水海砂再生混凝土(下同). (2) 研究不同强度等级的海水海砂再生混凝土与GFRP筋之间的黏结-滑移本构关系，其中变化水灰比为0.52，0.47，0.4以及0.37(分别对应普通混凝土强度等级为：C20、C30、C40、C50).立方体试件：150 mm×150 mm×150 mm，每组制作6个，其中3个用于中心拔出试验，3个用于测量混凝土的立方体抗压强度，其配合比见表 6. 混凝土采用小搅拌机拌制，搅拌均匀后浇筑到木模内振捣密实.不同强度的海水海砂混凝土实测塌落度为：SSRAC20：35 mm、SSRAC30：110 mm、SSRAC40：130 mm、SSRAC50：120 mm.塌落度实测结果表明，减水剂仍可以明显调控海水海砂混凝土的工作性能.混凝土的黏聚性和保水性良好.养护28 d，每天上下午分别洒水、覆盖湿薄膜来进行养护. 试验均采用短锚中心拔出试验，试件依据JC/T 406-2013进行设计，其中GFRP筋直径均为14 mm，黏结长度为5倍的GFRP筋直径：70 mm，试件尺寸如图 1所示，实验装置如图 2所示.图中，N为拔力. 滕锦光, 余涛, 戴建国, 等. FRP在新建结构中应用的现状及机遇[C/CD]//第七届全国建设工程FRP应用学术交流会论文集. 北京: 中国建筑工业出版社, 2011: 64. TENG Jinguang, YU Tao, DAI Jianguo, et al. The present situation and opportunity of the application of FRP in the new structure[C/CD]// Proceedings of the 7th National Symposium on FRP Application of Construction Projects. Beijing: China Architecture & Building Press, 2011: 64. American Society for Testing and Materials. Standard practice for the proparation of substitute ocean water: ASTM D1411—1998(2013)[S]. West Conshohocken: American Society for Testing and Materials, 2013. 中华人民共和国住房和城乡建设部. 土木工程用玻璃纤维增强筋: JG/T 406—2013[S]. 北京: 中国标准出版社, 2013. Ministry of Housing and Urban-Rural Construction of the People's Republic of China. 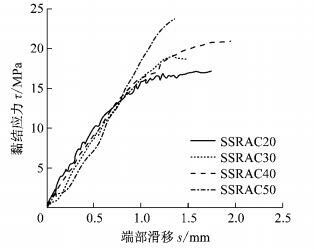 Glass fiber reinforced polymer rebar for civil engineering: JG/T 406—2013[S]. Beijing: China Standards Press, 2013. 潘宇. FRP筋与混凝土粘结性能研究综述[C]//第十六届全国现代结构工程学术研讨会论文集. 北京: 中国建筑工业出版社, 2016: 1241-1254. PAN Yu. 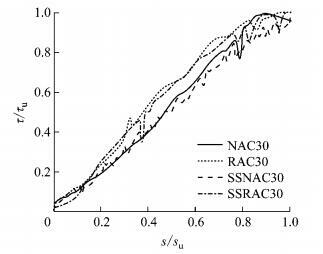 The overview of bonding performance of FRP rebars and concrete [C]// Proceedings of the 16th National Symposium on Modern Structural Engineering. Beijing: China Architecture & Building Press, 2016: 1241-1254. 彭义. GFRP筋拉拔模型试验及仿真分析[D]. 武汉: 武汉科技大学, 2014. PENG Yi. Model test and simulation analysis of GFRP steel bars [D]. Wuhan: Wuhan University of Science and Technology, 2014. American Concrete Institute. 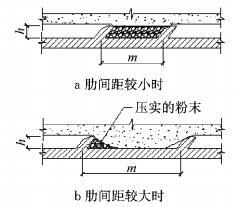 Guide for the design and construction of structural concrete reinforced with fiber-reinforced polymer (FRP) bars: ACI 440. 1R-06[S]. Detroit: American Concrete Institute, 2006. 中华人民共和国住房和城乡建设部. 混凝土结构设计规范: GB 50010—2010[S]. 北京: 中国建筑工业出版社, 2010. ELIGEHAUSEN R, POPOV E P, BERTERO V V. Local bond stress slip relationship of deformed bars under generalized excitations [R]. Berkeley: Earthquake Engineering Research Center, 1983.